According to <www.flagsonline.it>, the flag is white and charged with the eagle as at the coat of arms (without the shild). The Bolzano-provincia flag at <www.flagsonline.it> is clearly wrong, as it shows the red eagle on a plain white background, whereas it should be striped white-red. "La Provincia Autonoma di Bolzano ha il diritto; ai sensi dell'articolo 3 dello Statuto di autonomia, di avere accanto allo stemma anche un proprio gonfalone. Mentre lo stemma dell'Alto Adige (vedi alla pagina precedente) e stato approvato gia nel 1983, il gonfalone ha ottenuto l'approvazione definitiva da parte degli organi competenti a livello nazionale solo di recente, nell'autunno 1996. Dal punto di vista formale la deliberazione con la quale la Giunta provinciale ha chiesto l'approvazione del gonfalone (deliberazione del 7 ottobre 1996) e stata approvata con decreto del Presidente della Repubblica del 21 novembre 1996. Il gonfalone dell'Alto Adige e costituito da un drappo partito di bianco e rosso caricato dello stemma con iscrizione trilingue in oro: "Autonome Provinz Bozen-Südtirol" nel palo bianco, e "Provincia Autonoma di Bolzano-Alto Adige" nel palo rosso e "Provinzia Autonóma Bulsan-Südtirol" in parte nel palo bianco ed in parte nel palo rosso. L'asta verticale e ricoperta di velluto dei colori del drappo. Nella freccia e rappresentato lo stemma della Provincia". I send you a picture which shows three flags hanging from the wall of Castel Beseno (Trento Province). The left is South Tyrol. The flags for Tyrol and South Tyrol both must be white-red, only the eagles are diffenrent. The status of autonomy (of the region) says in its article 1 that the region has a gonfalon and some arms, which must be approved by decret by the president of the state.The new status of autonomy of the 20th of January 1972 says in its article 3 that the region, the province of Trento, the province of Bozen/Bolzano have all a gonfalon and a coat of arms which must be approved by decret by the president of the state. On the 2nd of April 1980, the government of the province of Bozen/Bolzano (South Tyrol) named a commission to work on propositions for the gonfalon and the coat of arms of the province. 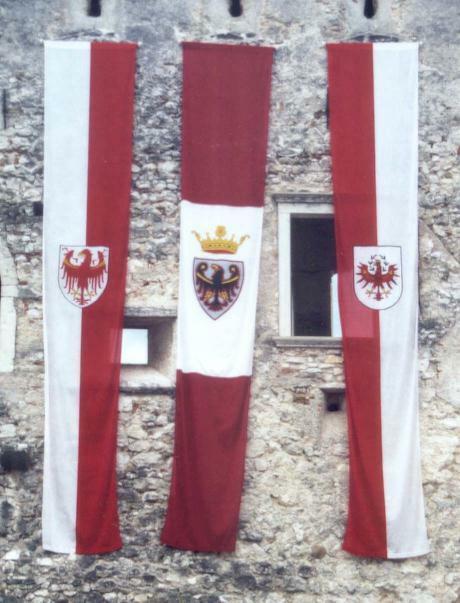 On the 6th of January 1981, the commission started to work on the propositions (especially the white-red flag of Tyrol and the Tyrolean eagle which is shown in the chapel of the castle of Tyrol (city)). On the 2th of July 1982, the commission chose as arms the Tyrolean eagle in its simplest form and the white-red Tyrolean flag. The president of the State, Sandro Pertini, approved the arms and the flag in March 1983. The arms of South Tyrol appear in the arms of the region and are registered in the heraldic register of Italy. It shall be said that the adoption of the arms and the gonfalon was not so easy because the Italian government didn't want that the province chose the coat arms of a foreign region. The coat of arms is a compromise since it differ a bit from the Austrian Tyrolean one.The gonfalon was accepted by the State with less difficulties. The coat of arms is described: argent a Tyrolean eagle gules armed or. The gonfalon is vertically red-white with the coat of arms in the middle and the words Provincia autonoma Bolzano and Autonome Provinz Bozen in gold. "South Tyrol [Süd Tirol] (Austrians of Alto Adige) - North Italy" - Horizontal white-red with shield bearing an eagle.